Energy supply specialist igus® has launched a guide trough system for energy chains that is quick and easy to install. guidefast® is a simple modular system that comprises mounting brackets, clips and a trough— significantly fewer components than standard systems, thus reducing installation time by up to 80%. The cost effective guidefast® system is part of the complete igus® offering for crane applications, which includes the trough, E2/000 series energy chain and chainflex® cables. The guidefast® system is available in galvanized steel, stainless steel and black powder coated steel to cater for a variety of application environments. Additionally, the troughs are available in 2m lengths and in a variety of widths to accommodate a large range of harnessed energy chain sizes and associated fill weights. 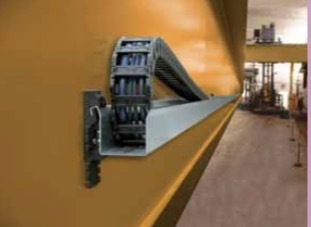 Cable entry points and prefabricated hole patterns are located along the length of the trough at 500mm intervals for attaching the energy chain, speeding up installation time and reducing costs. As always igus® is dedicated to providing innovative products and cost-effective, time saving solutions to its customers. Further to this, all igus products and pre-harnessed cable carrying solutions go through vigorous in-house testing and are delivered with the igus longer life guarantee. During testing, guidefast® has proven its strength and resistance against vibration and harsh environmental conditions.